Talent/Ideas - Muda #8Eliminate The Muda! The 8th Muda is waste of ideas and talent. We live in a society that promotes conformity. From an early age we are told to “not speak unless spoken to”, “wait your turn”, “don’t rock the boat”, “keep your nose to the grindstone”, and “do what your told”. We are raised to never challenge the status quo. In the process our potential for invention and creativity is stifled. Think about your work environment. Unless you are management, at some point you have found yourself on the sidelines or in the parking lot with a co-worker; you hear them complain about how things are being done, asking what management is thinking or expressing how things could be done better. In most environments can any one manager know every aspect of each job in a company? Can any supervisor oversee every transaction? The truth is, no one person is as smart as everyone. Imagine a company that can constuctively capture all the good ideas, big and small, from every associate. If we could find a way to tap the latent potential our companies, our country and our families would be better off. Why do the Japanese employees contribute so many more ideas? It is part of their culture; management and staff recognize everyone has value and is expected to contribute. There is a belief that no one knows a specific job better than the person doing it, therefore they enlist, even demand the active participation of the entire staff. Why are more of the Japanese ideas implemented? The Japanese have integrated the understanding of Walter Shewhard, the statistician that turned AT&T around in the early 1900’s with his discovery of statistical methods of quality control. They understand that by eliminating the muda (waste) of variation they will produce better quality with lower costs. They methodically apply the Shewhart cycle of continuous improvement also known as Plan Do Check Act (PDCA). Why are rewards so high in America, and considering this why don’t we have better participation and success? The authors argue that giving big rewards focuses employees on big ideas. If the idea isn’t big they don’t bother. If the idea is not as big as another’s, an employee may hold it secret until they think their chances are better to win the awards. As a result fewer ideas are submitted. The multitude of small improvements are discarded while only the bigger ideas are ever submitted. How can you, as an individual use this information? Recognize that your life is made up of many big activities and expensive decisions as well as many more small activities and seemingly insignificant expenses. When we add up all the little actions and miniscule costs they combine to have profound impacts on the use of our time and financial resources through life. Based on the data from the study it implies the combined value of the many smaller ideas has greater impact than a few big ideas. Some personal finance advisors dismiss the potential in taking the time to count your pennies or working to reduce your “latte” factor. Friends and family might scoff if you don’t “live” a little and stop worrying about every dime. No doubt we must make sure that life is worthwhile, however, if we don’t count our pennies and take opportunities to improve our efficiency we are liable to waste so much time and blow so much money that we miss out on greater opportunities in the future. Don’t be afraid to challenge the status quo. Leave no rock unturned. 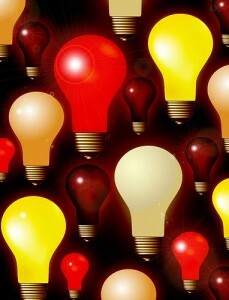 Ask question, seek out answers, be creative and live life by adapting, inventing and improving in every way every day.